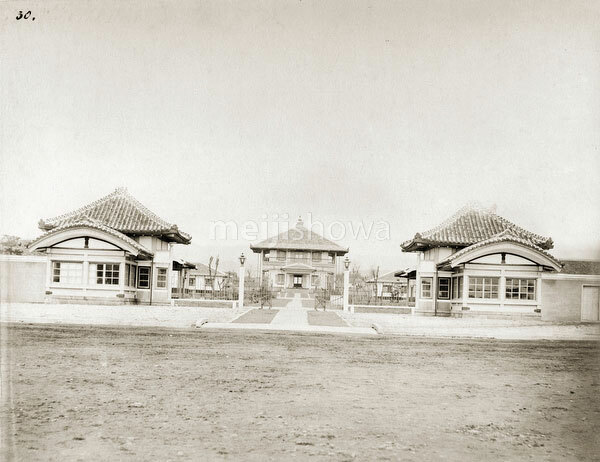 A very rare early image of Daiichi Chugakko, Japan’s very first “middle school,” in Kyoto. The school was the start of Japan’s modern education system. Established in Meiji 3 (1870) in Nijoujou Kita (二条城北), it moved to the building in this image, on the grounds of the former Kyoto Shugo (京都守護職屋敷跡, military governor) three years later. The school would later move again and this building was used for the Kyoto Prefectural Office (京都府庁) through Meiji 37 (1904).